Fruit is healthy. It’s also usually packaged in a slew of different plastic goodies that can be used to create divine texture on canvases, mixed media projects, and, of course, art journals! Texture Technique: Eat your fruits…and save the package! Strawberry containers, grape bags, Asian pear wrappers, and many other fruits are all packaged using different types of packaging which have circles, squares, hexagons, diamonds, and other sorts of designs. Instead of throwing all of that texture away, save it for use as a stencil or glue it straight down and gesso over it to create a tactile texture versus visual texture! This technique focuses on visual texture, rather than tactile texture. Texture Technique: Print on book text paper. Use washi tape to temporarily adhere book text to a piece of copy paper and print an image using your computer. This is perfect for those who are not patient enough to paint on every single art journal page! Tip: A lot of “washi” tapes are coated and the ink will bead up when using inkjet printers, so make sure you’re not printing directly on the washi tape. Bonus Tip: Use cloth medical tape on a piece of copy paper to print directly onto the tape and create your own personalized “washi” tape. I would recommend using a very tight pattern of text or a very tightly patterned image. If you plan to color the washi tape, you may want to do so before printing as you can smear the inkjet image. While this may not be the newest technique to most of you reading this, it’s a good technique nonetheless. 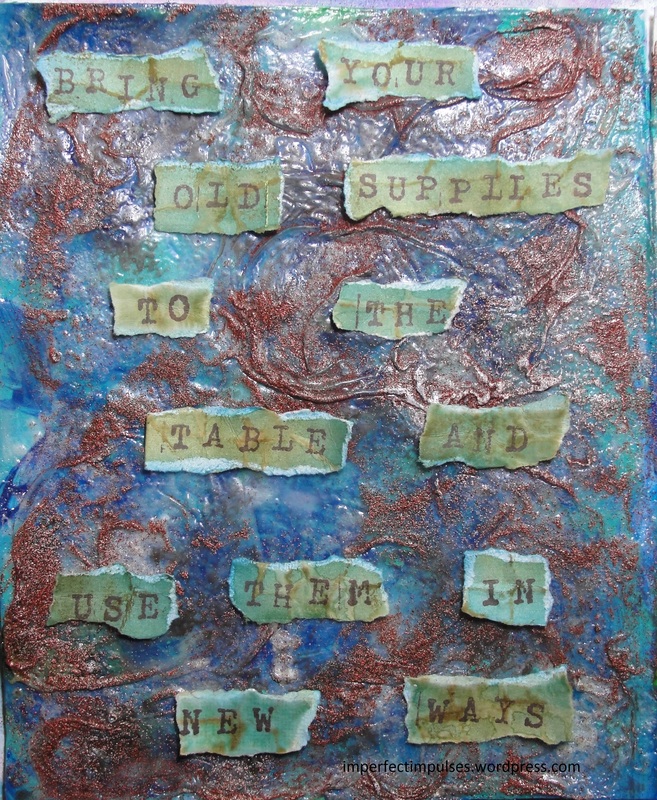 Texture Technique: Those paper towels and baby wipes you use to clean up Distress Ink, Dylusions, Lindy’s Stamp Gang, etc. are perfect to collage onto a background for added texture and color. It’s also more green than throwing them away! Tip: If you glue it down and don’t seal it, the paper towel or baby wipe will continue to be absorbent, but if you sandwich it between a layer of gel medium or Mod Podge, it will no longer be porous. Both techniques have their individual benefits and the “best” technique is the one that suits the project you’re working on! Resists are a wonderful, n’est-ce pas? They’re one of the coolest things we do in art journaling and general crafty/artsy endeavors. It’s like a magic trick! One of my most favorite resist techniques is done with Distress Ink and UTEE. Jenn, who is MixedMedia Jenn on YouTube, used this technique in this video. I absolutely love it as it’s so simple and so effective. Check out Jenn’s other videos as she’s a really talented artist who is new to YouTube and could use the exposure! UTEE or regular embossing powder can also be used to mask part of a project and then you can place a plain piece of computer paper, iron the paper and the embossing powder will be transferred to the paper leaving plain resisted paper behind. How cool is that?! Aside from UTEE, you can also use gesso as a slight resist (gesso is usually tinted by whatever media you use), but it will be lighter than bare paper which will absorb the media really quickly. Using gesso as a resist will usually give a nice tone-on-tone look. Resists can also be done using watercolor and masking fluid, however yours truly has no masking fluid, so I’ve yet to play with this particular resist technique. This simple technique can add a whole new dimension to any page. How do you do resists? I would love to see what you’ve made! I sat down to do this page and kept thinking “Be inspired”, “Be imaginative”, “Be…” and I realized how uninspired and how unimaginative those statements were. Then, I sat down to do this page and remembered Aleene’s Burnt Bag technique which is so cool but thought I could do it with a heat gun to give me the texture it created without the soot the candle creates. If you haven’t seen the video, here’s the link: http://www.youtube.com/watch?v=COOjdgpyAWc. The video is being created/uploading now, but here’s a sneak peak at the page I made for the letter B in my ABC’s of Art Journaling journal. Hope you enjoy it! Stay tuned for more! Art Journal Texture Extravaganza VIDEO! Here’s a video of the creation of a super textured page made using drywall tape and aluminum tape. Hope you like it! Okay, so my wife recently challenged me to write down my bucket list. I thought, “Oh, that’s silly. I know what I want to do in my life.” She insisted I type up 100 things I’d like to do before I die. So, I sat down at my trusty tablet and started typing up a list. At first it was filled with “Go to Paris, Go to Venice, Go to…” Then I really had to start digging deeper. What DO I want to do in my life? After I really started digging deep, I realized there are some things that I really, really want to do that I didn’t realize. I want to own my own business. I want to be the next Tim Holtz (ha!). I want to become a well-known blogger. I want to watch my son walk down the aisle. What a fun exercise this was. It really made me realize what I need to work for. I would challenge you to create a bucket list either in your art journal, smash book, or just type up a list on your computer. Art journaling is all about finding out who we are and where we’re going, so adding your bucket list into your art journal should be a given! Maybe your next art journal can have each page dedicated toward an item from your bucket list. This is a great way of coming up with a page theme or journal prompt when you’re feeling less than inspired. Now, get out there and create something!